With 73 hospitals and countless other healthcare facilities throughout the state, LPNs in Maryland are in demand for a number of roles. Maryland LPN jobs are expected to grow nearly 12 percent by 2022, with an estimated 1,500 positions being added to the 13,000 already in existence. Salaries for LPNs in Maryland are slightly above the national average, making the state a promising destination to earn an education and start a nursing career. Colleges from Baltimore to Cumberland feature accredited LPN programs that are training the state's next wave of practical nurses. 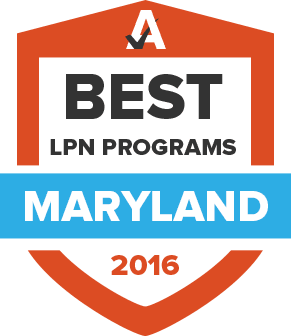 On this page, prospective students can find the top-rated LPN schools in Maryland and explore program details. Maryland LPN licensure requirements, salary information, and metro areas with the best job prospects are also covered at length. The path to becoming a licensed practical nurse in Maryland begins with the proper education and training. To get started on the right foot, use the search tool below to explore the various LPN programs throughout the state. Aspiring LPNs can view a side-by-side comparison of their top selections or browse through schools by the factors that are most important to them. For those who seek a career in nursing, becoming an LPN is the quickest way to do so. Maryland requires one year of classes plus hands-on experience. Find out what other requirements must be met to become an LPN in Maryland. To become a fully licensed LPN in Maryland, students must first attend a state-approved academic program and complete clinical hours during their educations. Once the one-year degree has been completed, students must fill out the Board of Nursing’s application for licensure by examination and successfully pass the NCLEX-PN examination at a nearby Pearson Vue testing center. Applications for licensure can either be completed online or by mail, depending on the candidate’s preference. Maryland-based LPNs must renew their licenses on a biennial rotation according to their birth date. Renewals may be completed online provided those seeking renewal have a valid email address. Depending on the date when a previous license renewal was issued, some LPNs may need to complete a criminal background check as this law is relatively new to the state. Nurses must also show proof of 1,000 hours of practice or complete a board-approved refresher course every five years. With a statewide median wage of $50,030, Maryland-based LPNs earn significantly more than the national average. Earning potential can vary greatly depending on whether an LPN is new or a seasoned veteran. This overview, provided by the Maryland Board of Nursing, is a comprehensive guide answering a number of questions prospective nurses have about the field. Every five years, LPNs must complete a state-approved nursing refresher course to successfully renew their licenses. MBON provides a comprehensive list of available courses. As of 2006, all candidates for LPN licensure in Maryland must submit to and successfully pass a criminal history records check. Details about this step are outlined on the MBON website. Prospective LPN candidates applying for licensure in Maryland for the first time use this application to complete their request. Nurses who practiced in a state that isn’t part of the Nurse Licensure Compact can complete an online endorsement form to have their license verified to practice in Maryland. In cooperation with the Office of Workforce Information and Performance, MDLLR provides an up-to-date look at occupational and industry data within the state, including relevant information about licensed practical nursing roles. New LPNs can use the MHA website to learn about healthcare within the state and scout out prospective jobs. This member-based organization is open to practicing LPNs within the state and offers an annual conference and membership meeting alongside other member initiatives. A number of free online training courses are provided on this website, alongside information about scholarships and financial aid for students considering an LPN program. MNA offers a variety of helpful resources, education information, advocacy efforts, and events to its members.